Kass Martin: Adventure here we come!!! 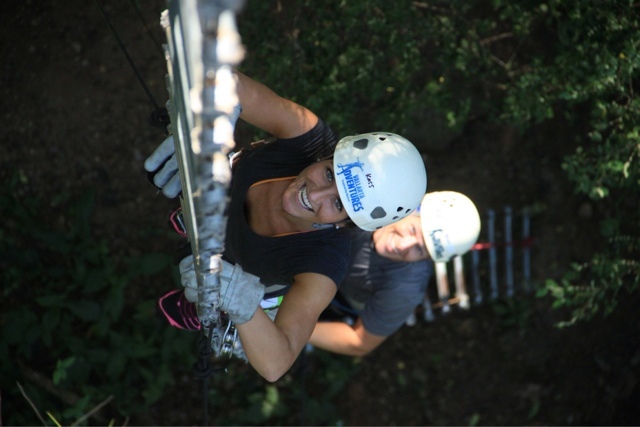 Our favorite day was zip lining through the jungle with Vallarta Adventures. Bri and I signed up for the zip line having no idea really what we were doing. I thought we were going to a building or park area and doin some easy breezy zip lines. Not the case. In the 45 minutes bumpy car ride up to the mountainous jungles of Mexico the couple to the left of us was telling us the rip roaring details of what was to come. My attitude wasn't superb. I was hesitant and nervous. But...I could see the excitement increasing in the eyes of my hubs so I kept it to myself. When we arrived at the adventure jungle area, we were suited up with bandanas (to help us feel tough and rugged) helmets (for more protection than I thought I was going to need when I woke up that morning) and all sorts or harnesses and straps. After a introduction of "Don't think about touching any of the equipment" (which was fine with me) "Let the professionals do their job to keep you safe" (again, fine with me) we were off on our adventure! What ever that may be. No turning back now! We had never done anything like this before together. It was AWESOME!!! 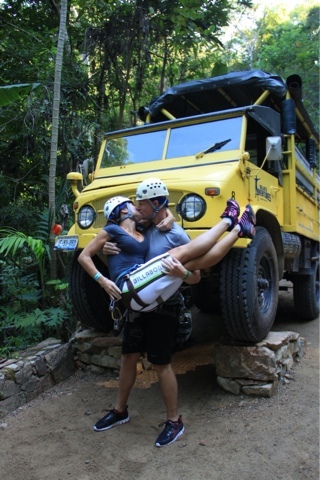 It's not everyday that parents, married for 10 years, get to feel like Tarzan and Jane. It was everything the couple prepped is for and more. There were multiple zip lines-all ranking in length and speed depending on the slant, rope walking high above the ground, repelling...I felt like a champion-facing my fears and reservations of going outside my standard "playing it safe mode". 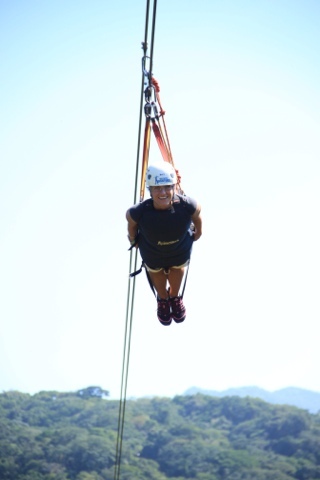 The end zip line was over a mile long, shooting through the air like Iron Man, it was incredible! My cheeks were sore from smiling so big! There was a tunnel of cleared branches where you got a glimpse into what it must feel like to be a bird. Free, Exhilarating. What a rush! Once the rush died down a bit we ended the adventure with the fastest and surely most dangerous water slide on the planet. Keep in mind-you're still wearing your safety helmet, without which my head would have not recovered. I was like a bullet coming out of this tube and felt relieved I had oxygen again and could see the sky. Again, Brian and I had no intention of signing up for anything extra. We were going to park ourselves at the beach and pool with a cold beverage and just chill for the week, so these activities, and this day in particular really changed the whole vacation for us and added a new level of excitement and renewed zest for adventure. We loved it!!! We went back to the pool that afternoon and relaxed. The "kids" pool always had exciting things happening. We usually hung at the adult pool but once in a while there was an activity we couldn't miss. The parrot show was awesome and I got to hold this feathered friend. I am smiling but know that I didn't trust this bird for the life of me. But something new for me. If I wasn't in sunny Arizona right now, recounting this trip might be too depressing for me missing the beautiful weather of PV. ;) we never wanted to leave. We wish someone would fly our kids to us and extend our trip a few weeks. Paradise! FUN!!! Looks like a blast. You look so cute!! Missing you in class. Have a good Holiday!